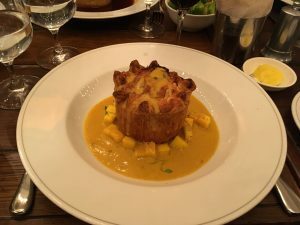 A ‘Masterchef’ applicant or work placement trainee might be inclined to compare their experience to a journey. New entrants to education have their progress monitored through a ‘learning journey’ either digitally or through scrapbook. My journey, or OE (overseas experience) in New Zealand parlance, was one many have taken; I emigrated to Britain. Why are school camps called school journeys in Britain? They’re journeys with destinations. The ‘journey’ is not the point. It’s all about the destination! Each of these is quite unlike a child’s reading journey. It is as though the child is tucked in and enabled with book food parcels and essential items throughout the journey. We know the benefits of starting reading right at the very beginning (thank you ‘Sound of Music’). 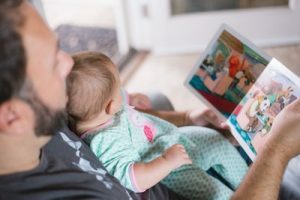 Building a library habit, having a personal collection of books from which to choose, is the backstop (thank you DUP) of a child’s reading journey. 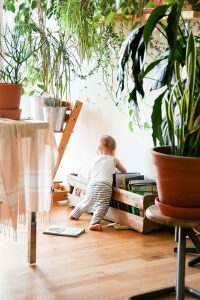 Evidence cites conclusively, that children who own books hold an advantage over those who do not. 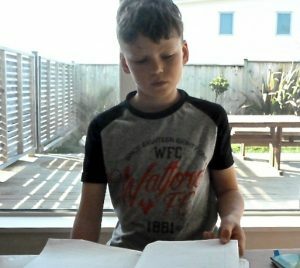 The Programme for the International Assessment of Adult Competencies, conducted by the Australian National University revealed:- ‘Teenagers with only lower levels of secondary education, who came from a home filled with books, “become as literate, numerate and technologically apt in adulthood as university graduates who grew up with only a few books”. Living with readers is an advantage to children. Bestselling writer, James Paterson states, ‘The best role models are in the home: brothers, fathers, grandfathers; mothers, sisters, grandmothers. 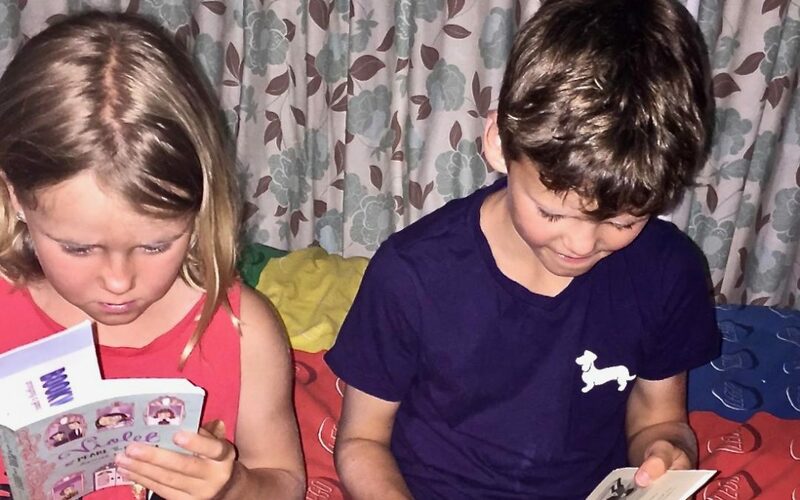 Mums and dads, it’s important that your kids see you reading. Not just books — reading the newspaper is good too.’ It’s like eating vegetables; what you do, they do. 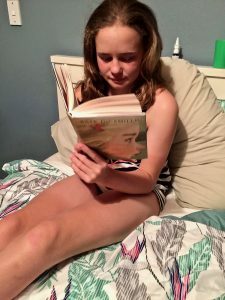 You’re along on this child’s reading journey, too! All readers go through stagnant patches, when it feels as though there’s not a single book that hits the spot. However, some readers would do anything (even deflea a cross cat) than read. They are ‘reluctant readers’. A New Zealand adviser, Donalyn Martin, calls them ‘dormant readers.’ I like that term. She suggests that they need to find a book to hook them. Humorous books, she advises, make a great choice. One of my great pleasures is luring a dormant reader out of her or his impasse. My thesaurus qualifies a journey as a quest, a sojourn, a pilgrimage, and an odyssey. Each of these suggests periods of quiet, a lull, a need for reflection. It’s the journey rather than the destination. Bookwagon seeks books from wide and far to enrich a child’s reading journey. Currently, I’m sitting at a desk with books from Australia, India and America. I have sought these out from research and feedback from reputable sources. We aim to impart the same sort of trustworthiness in our recommendations. 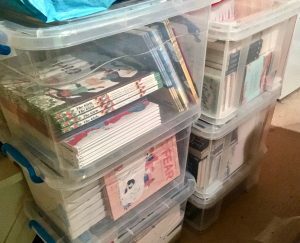 This week, we provided a London school with a year’s supply of assembly books, based on our knowledge and experience. 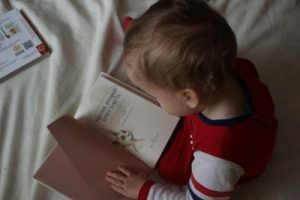 The prospect of a child’s reading journey starting each day with a wonderful book is meat and drink to us. What do we take from our reading journey? My reading journey piqued my curiosity so that I emigrated to experience the things of which I read. When a child’s reading journey is independent and necessary, you know she or he is a reader. Reading is evident through rereading, in the enquiry, self-motivation, and engagement with a writer, book and/or series. Such personal attachment extends intelligence, interpersonal and self awareness, empathy and the need to read and know and understand more. I prefer books rich in character, and have been less inclined to read fantasy titles. This preference has developed from my long reading journey. We have readers who prefer fantasy titles. My professional experience compels me to seek the best of these out for Bookwagon. 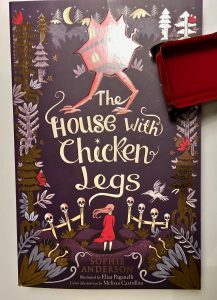 This week I read The House with Chicken Legs a fantasy tale with rich layers of meaning, developed by début novelist Sophie Anderson from a Russian fable. 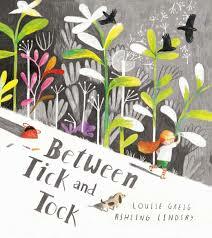 I recommend any winter weary worker Between Tick and Tock by the inspired Scottish and Irish picture book makers Louise Grieg and Ashling Lindsay. The tick and tock of a working life ebbing away is the theme of Cicada. 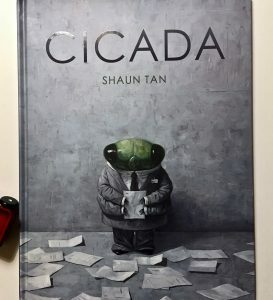 Australian Shaun Tan creates sophisticated picture books for older readers that disturb and haunt. This is no exception. Holocaust Memorial weekend offers a time to reflect on our society. 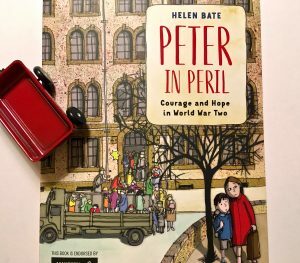 Peter in Peril is the true life experience of a Jewish boy in Budapest. The graphic novel format declares the stark innocence of Peter poignantly. We journey further into history in the magnificent Mega Meltdown. 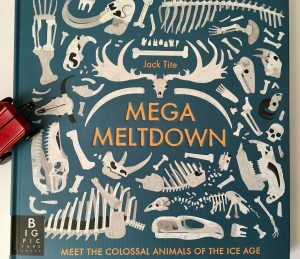 Jack Tite describes creatures that roamed our planet before the Ice Age. From habitat, to dimensions, comparable relatives and behaviours, this is a truly fascinating non-fiction book. 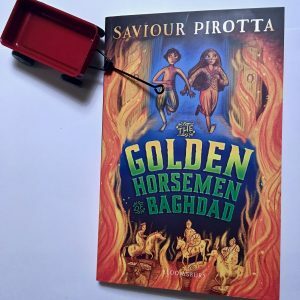 Acclaimed picture book maker, Jane Ray, led me to Saviour Pirotta. They created the beautiful The Unicorn Prince. His recent solo publication The Golden Horsemen of Baghdad, is inspired by the pilgrimage made from Baghdad to the court of Charlemagne in the ninth century. Harun al-Rashid’s gifts included an elephant, spices, jewels, fabric, chessboard and an intricate 12-hour water clock. I think Karen McCombie has written the book she was meant to write. 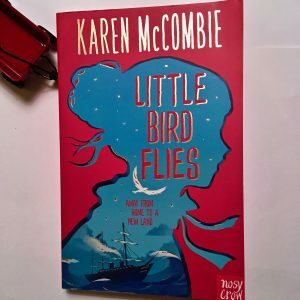 Little Bird Flies, set on a remote Scottish island in the nineteenth century, is an inspiring story of a young girl, yearning to escape the confines of her life and supposed frailty. I urge readers to experience the wonder of Bronze and Sunflower. Cao Wenxuan’s international award-winning story of two children caught up by events of the Chinese cultural revolution is moving and convincing. A child’s reading journey is richer for including this memorable title. This weekend Naomi Osaka claimed the Australian women’s tennis open championship. 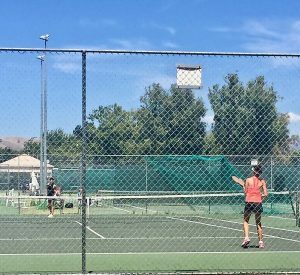 A new age is dawning in the women’s game. Mike is the story of Floyd, who has the potential to become Britain’s best tennis player. Yet Mike has other ideas. Writer Andrew Norriss based Floyd’s story from ‘next big thing’ to underwater explorer, on a radio interview he heard. 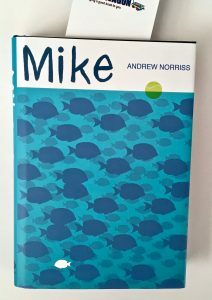 We recommend this empathetic, wise, gentle story to older readers and their parents. 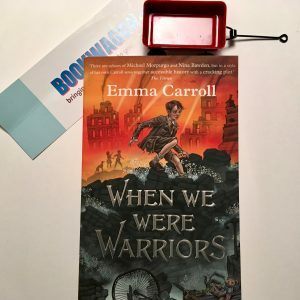 A child’s reading journey should include books by Emma Carroll. She is Britain’s ‘Queen of History’. We await next week’s release of When We Were Warriors. A child’s reading journey of this glorious book, will lead him or her along the South Coast of England. Three separate stories reacquaint us with familiar settings and characters from Frost Hollow Hall and Letters from the Lighthouse. 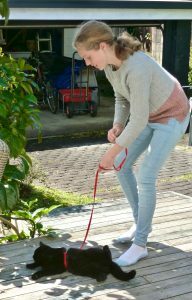 Each is linked by the theme of WWII, uncertainty, dogs, courageous children and an American soldier. Bookwagon holds rich reading pickings. Every book included has been read, loved, selected and described by us. Each includes a photograph or an extract for further information. Each week we take new families on board with gift book subscriptions. I love deciding which titles will best suit these new readers! We are proud to help families and schools along a child’s reading journey. The Bookwagon website focuses upon books alone. There are no unnecessary additions like coffee and cake, toys or cards. We offer knowledgeable recommendations to families and schools seeking to build readers for life. Our popup fairs are bespoke, with book selections according to venue and clientele. Bookwagon is all about bringing a good book to you!